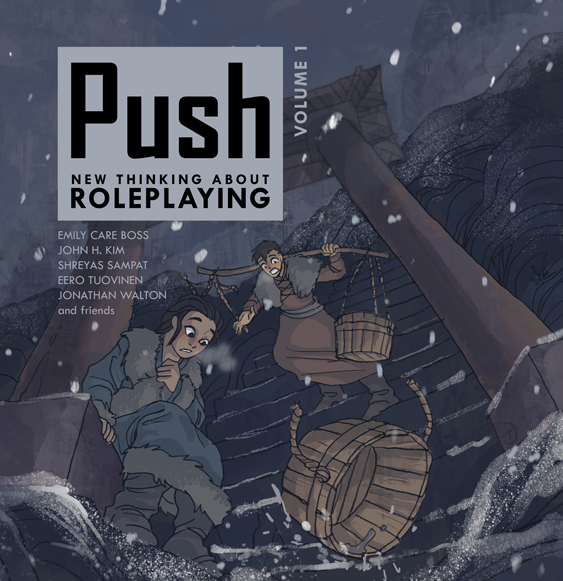 Push: New Thinking About Roleplaying, Volume 1 (July 2006) was the first and only published volume of what was originally intended to be an annual journal of analysis and experimental games. It was published just before GenCon 2006, which was the first time I met the folks from The Forge in person, though I had interacted online with that design community since 2002. To make it to GenCon with my box of 50 Lulu-printed books, I drove my 1991 Plymouth Acclaim from Boston to Indianapolis, camping along the way with Thomas Robertson and Shreyas Sampat. I’d never met Thomas in person, but had slept on Shreyas’s floor in Jersey one night when I was moving up to Boston. During our GenCon roadtrip, we decided to stop in Niagara Falls, Ontario, and had an insane time trying to get back into the U.S., partially because Thomas only had a provisional driver’s license printed on a piece of cardboard. The volume took nearly two years to put together, which was way longer than I originally expected. I began soliciting for drafts and concepts in late summer 2004, right after I graduated from college, and organized a secret “Push Editorial Board” forum on The Forge in October of that same year. The journal was originally going to be called “Magic Missile” (a name that later was revived for an ill-fated edited volume organized by myself and Ryan Macklin), but I changed it—due to probably groundless IP worries—to match the title of my short-lived second column on RPGnet, which they have apparently deleted (my first column, The Fine Art of Roleplaying, is still available). My brother, who works in indie comics, asked Clio about this cover some years later, and said she claimed not to remember it! Oh well. I had encountered her work in the first volume of Kazu Kibuishi’s Flight anthology, in which a bunch of young Canadian art school grads brought an anime and web comics sensibility to short-form print comics and basic blew the minds of everybody in the industry. I emailed Clio about the project and, to my complete surprise, she said yes. The piece itself illustrates a scene from my main contribution to Push, an experimental game called “Waiting for the Queen / Tea at Midnight,” which was itself inspired by a fairly long-running collaborative YA fiction thing—named The Ashes of Shaolin—that Thomas, Shreyas, Joshua Kashinsky, and myself worked on in 2004-2005. It was a weird request but Clio did an amazing job. I especially love the effect she created with the snow. I remember thinking at the time how refreshingly different it was for the cover of a game-related publication: it was a dramatic action shot, but there was no threat of violence, just a dropped bucket. The characters and setting were Asian, but that wasn’t really a point of emphasis; that’s just what they were. This piece seems a bit naively enthusiastic in retrospect, perhaps, but not too embarrassing. I mention that my main inspirations for Push were: (1) McSweeney’s, which was a relatively new publication then; (2) Flight, which I just described; (3) Beyond Role and Play, the 2004 Nordic convention book, which I ordered in a batch of 4-6 copies for distribution to U.S. indie games folks; and (4) Matt Snyder’s indie roleplaying zine, Daedalus (there were several more issues than what’s linked here). Without those, Push probably wouldn’t have happened. It’s both amazing and unfortunate that this may still be one of the best introductions to GM-less / GM-ful play available. Emily really knocked this one out of the park. Sure, some of it could be updated now to reflect the massive changes that have taken place in game design between 2004 (when it was originally conceived) and, say, the publication of Microscope and The Quiet Year. But Emily brilliantly grounded this article in the idea that collaborative play wasn’t anything especially new, even back in 2006, but that people had been playing in those styles for years. One of the things I really appreciate about John’s articles, and this one is no exception, is that he often structures them around relatively detailed and lengthy discussions of the actual play experiences that have led him to certain conclusions or ideas. When I think about this article, the things that sticks out most clearly in my mind are the examples drawn from his “Water-Uphill World” campaign. These are such strong images and do a great job of providing concrete illustrations of what are otherwise relatively abstract concepts. How cool is it that learning magic is an actual maze? Both the games in this anthology ended up being more conceptual-art pieces than things that saw a lot of play, which is unfortunate but maybe predictable, given how experimental and unplaytested they both were. Still, Shreyas’s game was especially ambitious and boundary-pushing, and some of the ideas contained in this game later saw a fuller expression in the knife ritual of Mist-Robed Gate (2008). So many neat things happening here: an alternative history of roleplaying games, gesture-based resolution, using temples as play spaces, etc. I’ve already discussed the collaborative fiction that gave rise to the subject matter here. Mechanically, I attempted to draw on the same old school text-adventure games that Jared Sorensen drew on for Action Castle and the other Parsely games, though Jared’s stuff is an independent and ultimately more successful development of similar ideas. Conceptually, it is kin to other two-player games, from Breaking the Ice to Murderous Ghosts, in terms of focusing closely on the back-and-forth between the players, something I explored earlier that year in Kazekami Kyoko Kills Kublai Khan (2006). Finally, the distinction between “action” and “expression” here is still interesting. One of the smartest things I did, inspired by the sidebar micro-fiction in the second edition of Nobilis, was to recruit some really brilliant folks to serve as commentators on the entire book. Some of the comments were funny, some were thoughtful, others were just strange, but it all added immensely to the reading experience and gives a hint of what the indie game community is like at its best: productive, enjoyable, friendly, creative, and loving. I had followed Victor’s blog, The Gaming Philosopher, for a while and really liked the way his brain worked. Jess was and is still a shining star that we are lucky to have in our medium. In fact, she just announced today that she’s taken a position teaching game design at Carnegie Mellon. Brand is a long-time freelancer, but we don’t hold that against him. Annie, who was simultaneously releasing games through Wicked Dead Brewing Company with Jared and John Wick, drew these terrific and very cute illustrations as a way of commenting. Paul Tevis was in the midst of running the greatest RPG podcast of all time—Have Games, Will Travel—which should be kept in a capsule for aliens to find. And Mo was writing Sin Aesthetics, the coolest RPG blog ever (yes, including, Anyway), and I hadn’t yet totally made a fool of myself by gushing about it to everyone. WHAT HAPPENED TO VOLUME 2? That’s a good question. It had a lot going for it. First of all, there was an amazing cover by Bethany Culp, based on an experimental game by Eero. Bethany actually built a model of a crazy owl-headed monster in a monastery, and then photographed it. Second, we also had articles on different aspects of roleplaying submitted by Tim Kleinart (The Mountain Witch), Jason Morningstar (The Shab-Al-Hiri Roach), and Bill White (Ganakagok), among others. Looking back, though, I think the thing that ultimately killed it was that some other pieces—the ones I was personally most excited about—ended up being vaporware or just taking so long to put together that it sapped all the momentum that I had. Among these were an overview of Nordic larp, two different articles on online freeform, a history of pre-D&D roleplaying, and a piece on the roleplaying scene in China. Additionally, the second volume wasn’t happening any quicker than the first, and I really didn’t want to spend another two years putting it together. After a while, progress ground to a halt, though it took me a long time to admit the second issue just wasn’t going to happen. I felt really bad—having accepted articles from folks like Tim, Jason, and Bill—for nothing to come of it. In retrospect, it would have been smarter just to make that call earlier, when the authors still might have been able to do something else with them, rather than have the project linger on until everybody had pretty much moved on to other things. The death of volume 2 also partially killed my enthusiasm for selling and promoting volume 1 (the other part was killed by taxes and bookkeeping, since I was splitting all profits with the contributors), so I eventually just made it free to download, with the permission of the original authors. In any event, I learned a lot from the process, and I hope it’s still interesting, both for its content and as a record of a moment in time when anything seemed possible (just like it seems now!). This entry was posted on	April 9, 2013 at 12:27 am	and is filed under Push: New Thinking About Roleplaying.